Have you ever missed a recording, had a tuner go bad or had other problems with your Windows Media Center HTPC? Most HTPC users have probably experienced problems like these one time or another, but usually we find out after it happened or days after the fact. Ian Dixon of the Digital Lifestyle has developed an app that may not fix those problems, but it will monitor your Media Center HTPC for these sort of problems and will notify you the moment something goes wrong. Media Center Health Monitor watches your scheduled recordings for any problems and lets you know whether the shows have recorded successfully or if they failed for any reason. The app also monitors Media Center recordings and scheduled services for any signs of trouble and alerts you to potential problems before they happen - nice! 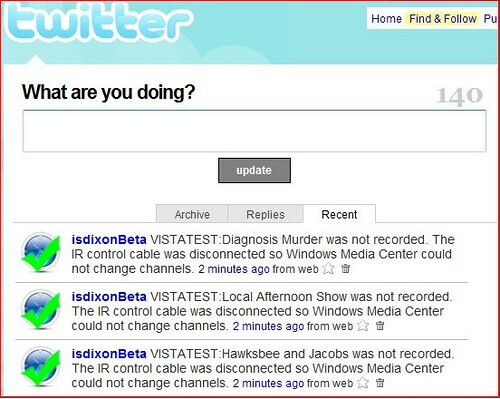 Media Center Health Monitor can notify you via e-mail, RSS feed, on the Media Center Health Monitor website and even twitter!